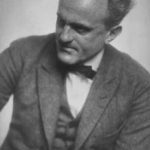 Paul Kammerer (17 August 1880, in Vienna – 23 September 1926, in Puchberg am Schneeberg) was an Austrian biologist who studied and advocated the Lamarckian theory of inheritance – the notion that organisms may pass to their offspring characteristics they have acquired in their lifetime. He began his academic career at the Vienna Academy studying music but graduated with a degree in biology. Kammerer’s work in biology largely involved altering the breeding and development of amphibians. He coerced ovoviviparous fire salamanders to become viviparous, and viviparous alpine salamanders to become ovoviviparous. In lesser-known experiments, he manipulated and bred olms. He made olms produce live young, and he bred dark-colored olms with full vision. He supported the Lamarckian theory of the heritability of acquired characteristics, and experimented extensively in an effort to prove this theory. Kammerer succeeded in making midwife toads breed in the water by increasing the temperature of their tanks, forcing them to retreat to the water to cool off. The male midwife toads were not genetically programmed for the underwater mating that necessarily followed and thus, over the span of two generations, Kammerer reported that his midwife toads were exhibiting black nuptial pads on their feet to give them more traction in this underwater mating process. While the prehistoric ancestors of midwife toads had these pads, Kammerer considered this an acquired characteristic brought about by adaptation to environment. Claims arose that the result of the experiment had been falsified. The most notable of these claims was made by Dr. G. K. Noble, Curator of Reptiles at the American Museum of Natural History, in the scientific journal Nature. Noble, after a microscopic examination, claimed that the black pads actually had a far more mundane explanation: they had simply been injected with Indian ink.